And now Daxter is finished! 11 september, 2007 Säg något! So I’ve been playing Daxter like a madman. Its a great game. Much better than I had expected. Not as good as the real Jak & Daxter games, but still very good. And you just gotta love Daxter. He is one cool dude. The game suffers from some camera problem. Thats just about the thing that is negative about the game. Thanks to the camera you are going to die some times at certain stages. If they had fixed that, the game would have been more or less perfect. Oh, okay. There are some slowdowns in the game. They are nothing to worry about, but they are very annoying. The story is good. And lets you know what Daxter was up to between those two years that passed between the first and second game. I like when they do games like this. 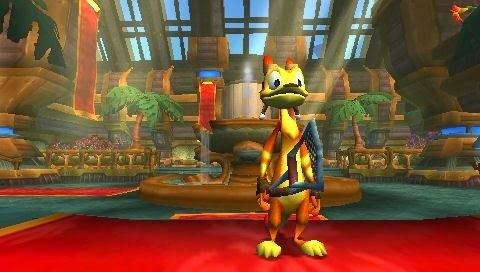 Hope we can see a Daxter 2 in the future. I’ll give Daxter a 7/10. It would have received an 8 from me if it wasn’t for the camera problem. But if you already haven’t played this game, I think you should. Especially if you are a Jak & Daxter fan. And now I think I’m going to start playing Metal Gear Ac!d. Take care everyone!